Looking for a USED D1400W970 10TONS? 1. The machine bed has 970mm in width and 710mm in height, adopts V-flat guideways of excellent craftiness. With the box shape canting pull rope structure of high rigidity, it is also designed for a casting structure and appropriate rope arrangement internally. The guideways adopt the middle frequency quenching-grinding process. Wear resistant materials applied on the friction pairs of guideways. 2. The front diameter of spindle is 200mm. The triple supporting structure has formed the spindle a feature of high rigidity, high strength as well as high accuracy. Bearings with high accuracy of KOYO (Japan) or NSK would be selected for spindle use. Double row cylindrical roller bearings with high machining accuracy will be used for front and back bearing journals, the inner circle of which is a tapered hole with taper of 1:12. Besides matching design with tapered journal of spindle, the inner circle may adjust the clearance of the bearings under the condition of axial movement, thus effectively improving the accuracy. 3. 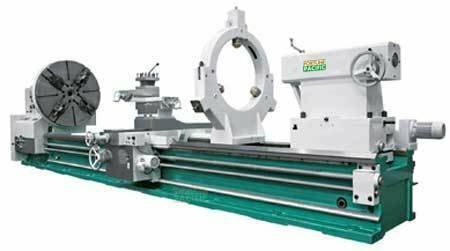 Live centers are equipped internally in the tailstock sleeve whose diameter is 200mm. The tailstock is divided into upper and lower body. Spindle is equipped in the upper while motor-driven and backward preventing security mechanisms are equipped in the lower. 4. Automatic feeding mechanically. Double-layer compound rests are equipped in the machine tools whose swing diameter is above 1400mm, which easily realize the longitudinal or cross feeding operations. 5. The electromagnetic clutch driving and cross handle switches greatly improve the easiness of operation. Looking to Purchase a New FORTUNE PACIFIC D1400W970 10TONS?